Libraries are offering 'Food for Fines' to lower your late fees and help the community! Pay your fines and help those in need! It's National Library Week, and if you have any overdue fees, bring in food to lower those fines! 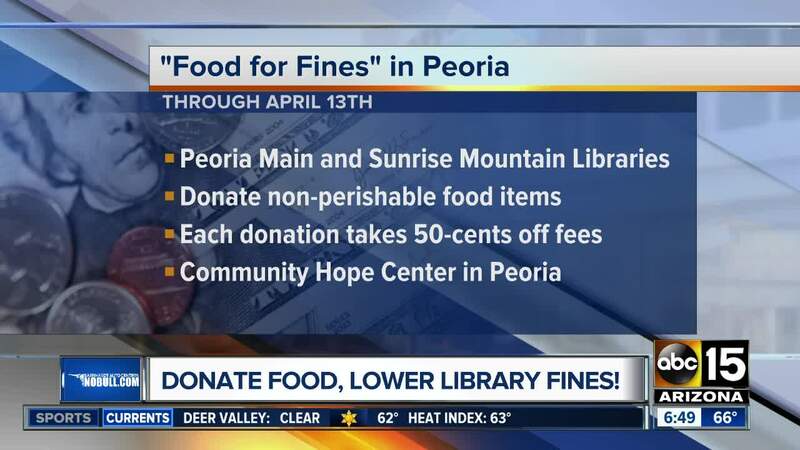 Now through April 13, 50 cents will be deducted from your fines for each non-perishable food item collected at the Peoria Main and Sunrise Mountain libraries. Donations will be accepted, even if fees are not being paid. There is a maximum of $25 paid with donated food. That would be 50 items! The donated food will be distributed to the Community Hope Center in Peoria. Click here for all the details. The Phoenix Public Library's Annual, 'Food for Fines' runs April 6 - 20. A full $1 will be deducted from the fees for each non-perishable food item you bring to any of the 17 locations. A maximum of $75 can be paid with donated food. The donated items go to St. Mary's Food Bank and Desert Mission Food Bank. This drive collects more than 20,000 pounds of food to help stock up for the summer. Click here to see what items are needed. Tempe will be doing a version of this in the summer. Instead of food, they'll be collecting water for fines. Then, in the fall, they'll be collecting more food. Check back here for updates. Do you know of another city or library doing something similar? If so, email me , and I'll add them to this list! Enjoy this drive. It's a win-win for everyone!